Professor Kaiyu Guan, left, graduate student Yunan Luo and professor Jian Peng have developed a new algorithm that solves an age-old dilemma plaguing satellite imagery – whether to sacrifice high spatial resolution in the interest of generating images more frequently, or vice versa. Their algorithm can generate daily continuous images going back to the year 2000. CHAMPAIGN, Ill. — Using a new algorithm, University of Illinois researchers may have found the solution to an age-old dilemma plaguing satellite imagery – whether to sacrifice high spatial resolution in the interest of generating images more frequently, or vice versa. The team’s new tool eliminates this trade-off by fusing high-resolution and high-frequency satellite data into one integrated product, and can generate 30-meter daily continuous images going back to the year 2000. Monitoring of agriculture, urban development, environmental quality and economic development are just a few ways people make use of satellite data. The new algorithm is generic enough for use in virtually any application. In agricultural applications, imaging at 10- to 30-meter resolution is critical for farmers to see field-level rapid and subtle changes in crop conditions that affect yield, such as crop stress and disturbance after extreme weather events. Existing data have either insufficient spatial resolution or low frequency, the researchers said. Farmers usually require information with both high-resolution and near real-time occurrence. 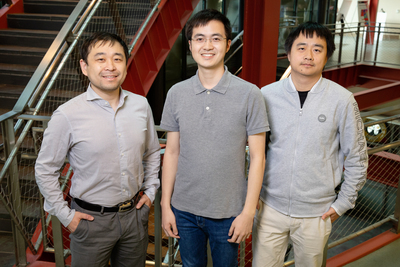 Guan, a Blue Waters professor at the National Center for Supercomputing Applications at Illinois, teamed up with professor Jian Peng and graduate student Yunan Luo of computer science to develop an algorithm that fuses satellite images from multiple sources into continuous, daily high-resolution images. The researchers describe their methodology and findings in the journal Remote Sensing of Environment. “We first ingested all of the available satellite data sets into Blue Waters, the National Science Foundation’s leadership class supercomputer. With a click of a button to run our algorithm, what automatically comes out are daily high-resolution images available for all sorts of scientific applications,” Guan said. Previous researchers have developed methods for fusing high-resolution spatial and temporal data, but these came with limitations. Almost all of the algorithms lacked automation and could not simultaneously deal with missing pixels and temporal fusion. These drawbacks led to short-term and localized applications. To overcome the limitations of previous methods, the team designed the algorithm to automatically integrate information from existing data. This compensates for missing information resulting from cloud coverage or data gaps. The new algorithm can create images without any missing pixels, for any site or region, by leveraging time-series information and relations with neighboring pixels. In addition to near-real-time daily high-resolution data collection, the team envisions building long-term daily, continental-scale images for various applications. “The type of high-quality satellite data required to run this algorithm has been collected since 2000, meaning we can generate daily 30-meter resolution images for any location on this planet going back in time,” Guan said. The researchers have already successfully fused surface reflectance data in Champaign County, Ill., and generated daily time series for the growing season of 2017 at 30-meter resolution. “Even though others have invested in similar technology, they could not go back in time like we can,” Guan said. “The data sources for our algorithms use the most rigorous data from NASA or the European Space Agency and produce daily fusion data that is ready for research and practical applications.” Guan said. NASA, the National Science Foundation and the State of Illinois supported this research. To reach Kaiyu Guan, call 217-300-2690; kaiyug@illinois.edu. To reach Jian Peng, call 217-300-2825; jianpeng@illinois.edu. The paper “STAIR: A generic and fully-automated method to fuse multiple sources of optical satellite data to generate a high-resolution, daily and cloud-/gap-free surface reflectance product” is available online and from the U. of I. News Bureau.